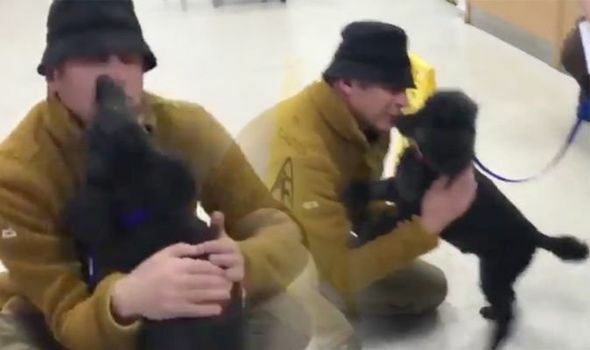 These heart-warming scenes show the popular television presenter being reunited with his beloved poodle Scratchy at the vets. More than 170,000 fans have watched the 30-second clip as the elderly pet scampers into Chris’s arms after undergoing a cataract operation. A massive smile breaks out on the Springwatch star’s face as Scratchy excitedly wags his tail and smothers his delighted owner with lots of licks. Immediately, the clip generated a massive outpouring of joy from social media followers as the scene was ‘loved” by 17,000 people in the first few hours. Among the hundreds of comments was one from a fan who admitted: “Ooh! Made me cry. Lovely, lovely video. Well done little Scratch.